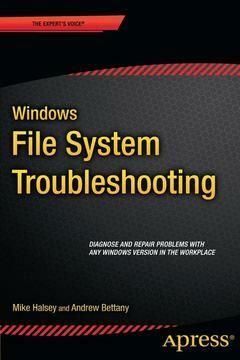 Windows File System Troubleshooting, 1st ed. The Windows file system is large and complex, featuring not only a huge number of essential files and folders for the Windows OS, your software and hardware, but also several different underlying file systems that manage and maintain file integrity on your disks. In this book you’ll learn how to navigate around the Windows file structure (up to Windows 8.1), with what does what and how essential everything is. Additionally we’ll show you how to effectively manage file, folder and security permissions to ensure users get what the access they need, and no more. We’ll also show you how to repair the underlying disk file system should something go horribly wrong. Chapter Goal: The disk file system in Windows is also prone to errors, this chapter will get readers started in diagnosing and troubleshooting errors. Chapter Goal: Sometimes it all goes horribly wrong and users can be locked out of just about everything. This chapter will teach readers how to manually reset the file and folder permissions on all files and documents in a safe and secure way. When might you need to universally reset permissions? Andrew Bettany is a Microsoft Most Valuable Professional (MVP), recognized for his Windows expertise, and a member of the Microsoft Springboard Technical Expert Panel.As leader of the IT Academy at the University of York, UK and Microsoft Certified Trainer, Andrew delivers learning and consultancy to businesses on a number of technical areas including Windows deployment and troubleshooting. He has created and manages the "IT Masterclasses" series of short intensive technical courses, www.itmasterclasses.com, run through his own training company Deliver IT Training Ltd.Passionate about learning and helping others he frequently donates his time to work with Microsoft. He is a frequent speaker and proctor at TechEd conferences worldwide. In 2011 he delivered a "train the trainer" class in earthquake-hit Haiti to help the community rebuild their technology skills and returned again in November 2013 to deliver a second bootcamp.Very active on social media, Andrew can be found on LinkedIn Facebook and Twitter. He lives in a village just outside of the beautiful city of York in Yorkshire (UK). A book for IT Pros to help them diagnose and repair problems with any windows version in the workplace, software incompatibilities, file and disk permissions, security and low-level file system errors.